The Web is a great place to find images. Here is how to proceed to create icons using these images. 1. Launch your Internet browser and surf to the desired page. In the Recently Used zone (in the main toolbar), type the full Internet address of the desired page, hit Enter. 2. The page opens in a document window. 3. Right-click the desired image then choose Copy. The image is copied into the clipboard. In the Name group ( ), enter the icon project name. Do not specify any extension. In the Image Formats group, select the image formats you whish to add in the icon ( ) and unselect the unwanted images ( ). To know more about the desired Windows® standard image format, see What is an Icon topic. If you wish to start creating your icon with an unlisted format, click the Other Image Format button. When done, click OK. The icon is automatically created with the various image formats you've selected. Select Edit/Paste as New Image or press Ctrl+I. A new document is created containing the desired image. 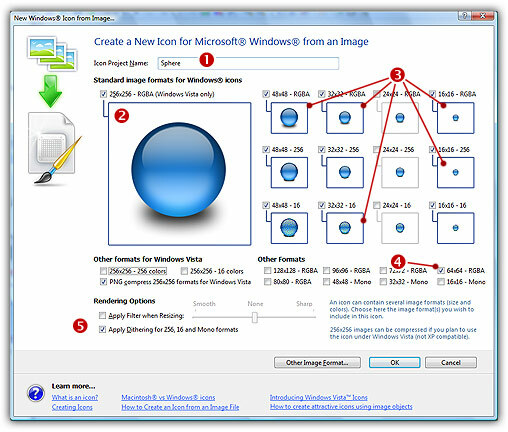 Now follow Step 2 procedure as in topic: Create an Icon from an Image File. Using the clipboard, you LOSE the transparent areas if any. 3. Right-click the desired image then choose Save Picture As. Store the image on your hard disk using a new filename. 4. 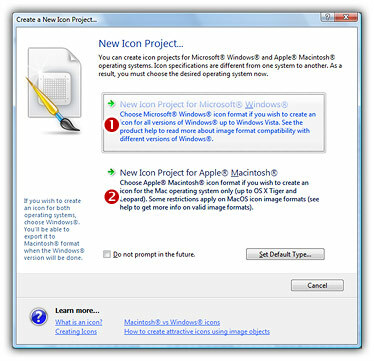 Now, create your icon as in topic: Create an Icon from an Image File using the newly created file. Using a temporary file, you KEEP the transparent areas if any.